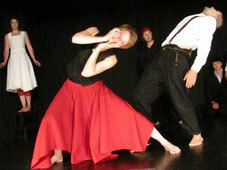 The MimeCenter Cologne is a school for mime and physical theatre. We are an international school - that means we are open for people from all over the world. We also do speak English and French! The MimeCenter is based in Cologne - in the middle of Germany. The School of Mime & Physical Theatre offers a full time professional training specially designed for people wishing to prepare for a career as a working artist, performer und creator in mime. We do offer a two year professional diploma programme and a 3rd year of specialisation in directing and teaching. If the student has finished our education programme successfully, he (or she) will do have a diploma in mime / physical theatre, pedagocial skills and his (or her) own show. please don´t hesitate to contact us for further informations!